Does the idea of starting a business sound stressful or overwhelming? Well, it doesn’t have to be. With a large network of mentors and business coaches available, you are no longer alone in your startup efforts. An experienced coach or mentor can offer you expert advice on how to avoid the pitfalls of starting your own business. Here to tell us more about the importance of business advisors is George Deeb, startup expert, and author of 101 Startup Lessons: An Entrepreneur’s Handbook. For small business owners and entrepreneurs who are learning to run a business for the first time, business coaches and mentors can add a lot of value to your startup. Their experience and wisdom can help you through the uncertain first stages of getting your business off the ground. There is a steep learning curve that you can climb in half the time with the aid of someone more experienced. Think of them as resources to lean on during the tougher times. Your own personal network: look through your contact and see if there is someone who is an expert in the area that you are struggling with. LinkedIn: search for the keywords in various topics to find connections that dealing with the same topic as you. Startup accelerators and incubators: You don’t have to join the organization to find excellent mentors. Chances are they are advertised in the accelerator or incubator website and you can reach out to them individually for assistance. Keep in mind that mentors and business coaches serve different purposes. A mentor shares their insight for free as long as you don’t abuse their time. Business coaches typically come with a package or hourly rate for their services. It’s also important to remember that the right advisor for you is someone with experience dealing with the same type of pain point that you’re trying to solve. 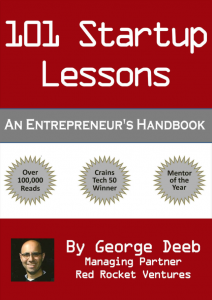 101 Startup Lessons: An Entrepreneur’s Handbook.